George Assadourian is a place I’ve been going to for about ten years now — its a commercial bakery that only makes for the most part variations of a single product – Lahmajuns. What’s a Lahmajun? Well, its often described as the Armenian or Middle-Eastern analogue to the Pizza. However, a Lahmajun has a very thin crust, and is topped with a meat sauce topping, usually lamb or beef-based, that is cooked with tomato and Middle Eastern spices. And man do they make great snacks at about midnight. Here’s the Assadourian storefront on Anderson Ave in Fairview. 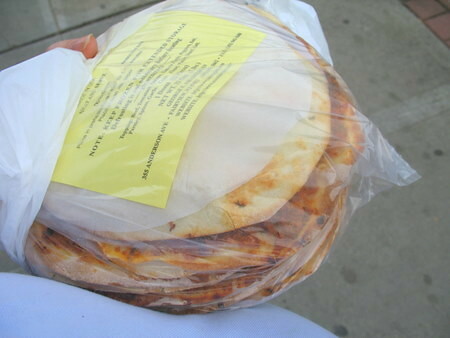 Assadourian is the most well-known producer of Lahmajuns in the entire NY metro area, and their product is sold to many specialty supermarkets and grocery stores. However, you can typically only buy their product frozen from those places. Getting your Lahmajun fresh from the source makes a huge difference. 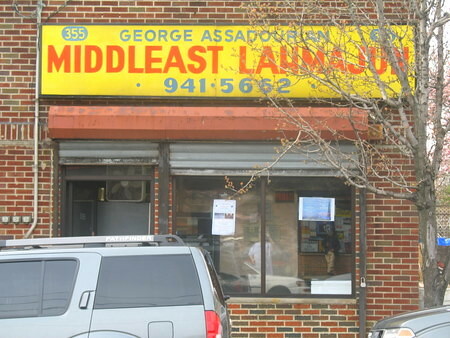 As Assadourian is a fully USDA inspected facility, they can also ship you Lahmajun directly. As you can see, there’s not a lot to the place. You walk up, theres a big metal wall there, and you knock on the door and ask them what kind of Lahmajun they have that day. Depending on which variety they are baking and when, they might have one or two varieties available freshly baked. They also have a bunch of different kinds in their chest freezer up front, such as the whole wheat and veggie kinds. They also have frozen Kibbeh, which are little bulghur wheat football-shaped things stuffed with meat. A 12-pack of freshly baked Lahmajun. 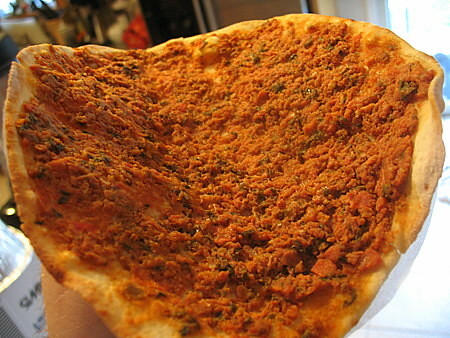 Lahmajun close-up. Assadourian’s Lahmajun are produced in a Syrian style, using beef, onion, parsley, peppers, garlic, tomato paste and other spices. You can either eat them at room temperature, or you can toast them. They go great with salads for a light lunch, or you can just eat them on their lonesome. I like to give them a shake of hot sauce as well. This entry was posted on Saturday, April 14th, 2007 at 7:14 pm and is filed under Food, General, New Jersey. You can follow any responses to this entry through the RSS 2.0 feed. You can leave a response, or trackback from your own site. I’m pretty darned sure that this the brand of lahmajun that I grew up with during the 70’s (a friend of the family is Armenian, and her homemade kufta and grape leaves- yaprak sarma- remain my baseline for those items to this day. She always had those lahmajun to snack on in her house). I get mine in River Edge, at Olympia Foods of All Nations, and love having them in the freezer for a late night munchie craving. I prefer aleppo pepper to spice them up, though. I forgot to say that I love both lahmajun and kubbeh. I used to get great lahmajun at a Turkish Imbiss in Schwaebisch Hall, Germany where I used to live. The family that owned this imbiss were from Eastern Turkey and they also made fantastic stuffed pide. Yep, you’re right, I’ve fixed that. The kofta (kufta?) I’m familiar with is actually a casserole of ground meat and bulgar layers, cut into diamond shapes that is sturdy enough to eat with your fingers- it makes a great party food, fwiw. Those Kibbeh, I’m assuming, have the same sort of flavor and texture but are even more suited to eating with one’s fingers. Good to know. Damn! that last shot is absolute heaven. There’s an Armenian place in Glendale, CA that makesones that look just like that. I try to visit it whnever I am up there. BTW, I’m still trying, but I’ve never managed to recreate the Lebanese Lahm-bil-Ajeen I grew up eating in Beirut..usually for breakfast. If I nail it, I’ll let you know. You my want to try Fatal’s Bakery for Lebanese (Syrian?) pies of the same ilk. They make them when you order them and they have cheese, zatar, meat, spinach, and vegy with olives. A few tables great falfel, Halal butcher and all the Middle eastern groceries you’ll need. Fatal’s is on Main ST. in So. Paterson. I get lahmajuns there whenever I am in Fairview. They are good. The older woman that works behind the screen door once explained to me how healthy the lahmajun is because of its vegetable content. I believe her. They have a lot of garlic in them. I like the spicy ones, they are very hot. Everyone the right way to eat them is with a splash of lemon juice…Im Armenian andTRUST ME its the best way. I’ve been goin to this this place basically since a little toddler in the early 80s and they are the best thats why they’ve been around forever. I moved from NYC in 1983. The best lahmajoon I recall came from a Lebanese (?) deli on, or near, Atlantic Avenue in Brooklyn. I used to get wonderful cooking (Lebanese, I think, and pretty close to Armenian) in a tiny family run restaurant nearby. I’mvisiting again in November and wonder if any of this still exists in that area?? Incidentally, in my (Armeninan) household, the lahmajoon (in copious quantities!) was usually eaten with a large bowl of home made yoghurt, rather than lemon juice. We live in the Villages in Florida,near Ocala.Is there any place that I can get some lahmajun or can I order it from you.We bought some from a church picnic. could you please let me know if I can order lahmajun from you, I live in troy, n.y.
I’m very lucky to live near this place! Lammies, as my Armenian friend calls them, are to die for. Toaster oven, works perfectly. Cut some healthy greens, fold it, and have a great little meal!